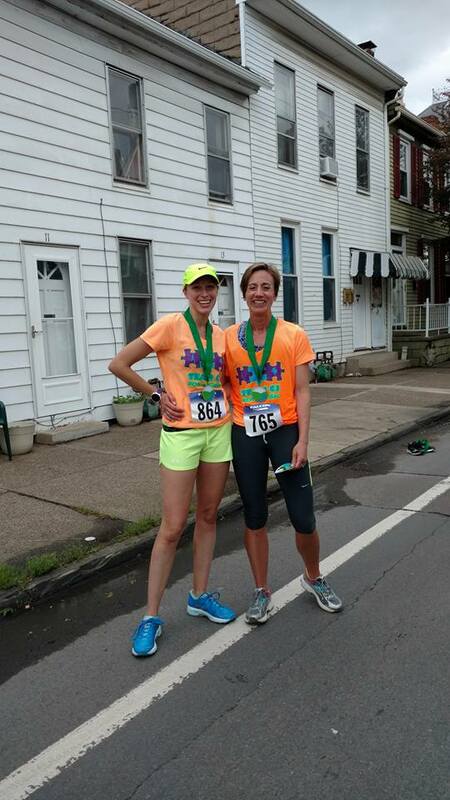 My adventures in running with some tidbits on mothering, autism, and living practically. My third 70.3 of 2017 was the Inaugural IRONMAN 70.3 Lake Placid held on Sunday, September 10th. I gotta say that even though I felt strong and healthy in general, I was also pretty tired and worn down from the year. I had no idea what to expect from myself at this race. That's an unsettling feeling. And being without a time goal left me feeling a tiny bit lost. So I resolved to go to Placid, do my best on race day (whatever that may mean), and enjoy the experience. I love the challenge of training and triathlon, and sometimes I have to remind myself that I am crazy lucky to be part of it at all. I know we're only two weeks out, but details are already a bit blurry for me, so bear with me as I try to remember the order of events! I caravanned up to Placid following friends Lynn and Charlie. We made pretty good time arriving mid-afternoon. I'm pretty sure I unloaded the car and then made way to packet pick up with Team Taper teammates Lynn, Laurie, Ami, Eric, and Chris. We all checked in and then hit up the expo. I was in search of gloves. I have never worn gloves while biking before, but was pretty sure I would need them on Sunday. The expo didn't have any, but I did snag new goggles, socks, and a sticker for my car. Then our group went down to the bike shop in town, High Peaks Cyclery, where I was able to grab some gloves. We had planned to head back to the houses, but when we came out of the store it was raining! So we stopped in at Lake Placid Pub & Brewery for a pre-dinner beer. They actually crafted a special 70.3 brew just for the event! While sitting at the bar, we chatted about the race and triathlon in general while trying to firm up dinner plans with the teammates that weren't at the bar. We ended up going down to Lisa G's. By the time we were done with dinner it was dark and much colder out and we had over a mile to walk back to the house. I was soooo tired and not dressed appropriately at all. I was hoping to make it to the mandatory athlete briefing that night, but it didn't happen. The next day held an orientation swim, followed by a drive on the bike course (thanks for navigating, Lynn! 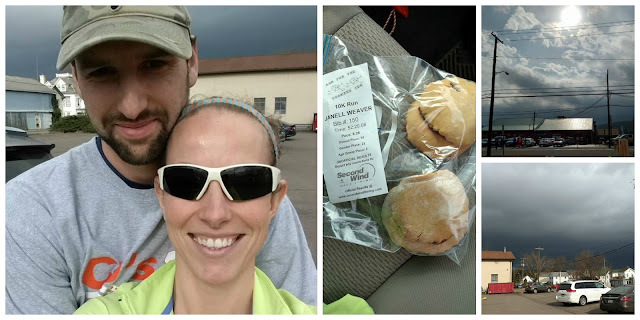 ), bike check in, mandatory athlete briefing, lunch at "46 Sandwiches" (aka Big Mountain Deli and Creperie), grocery shopping, and finally dinner in. Our house was tucked in so early that I blogged about my race at Rev3 Williamsburg before getting ready for bed. Then, looking for encouragement, I read and reread my coach's words, watched the Nike motivational video a few times, and something else I've done since my first OWS tri to help me through the race, I selected a song that through training spoke to me and then listened to it a dozen times. Laugh if you will, but a song in my head stuck on repeat gets me through the swim and seems to start playing again when the going gets tough on the bike or run. The song for Placid was Hard Love from Needtobreathe. Next morning, 4am wake up call. Because we were so close to the swim start and transition, I decided to go set up my transition then come back to the house before going to the swim start. 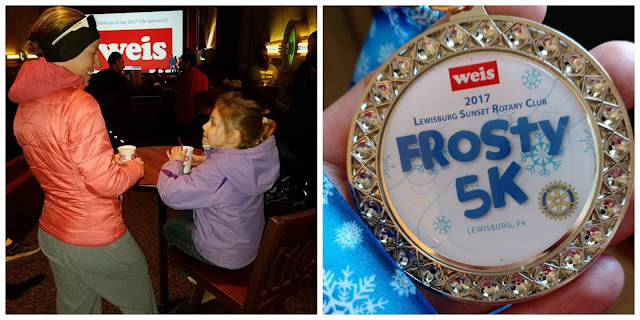 This worked out really well because I was able to get a few more calories in my nervous belly than I would have normally been able to, I stayed warmer longer, plus indoor plumbing trumps porta-potty any day. Once I began my walk back to the swim start I met up with Larry, Chris, and Eric. We lucked out and found space inside a warming tent to hang out while we waited. Next summer marks twenty years of the full Ironman at Lake Placid. 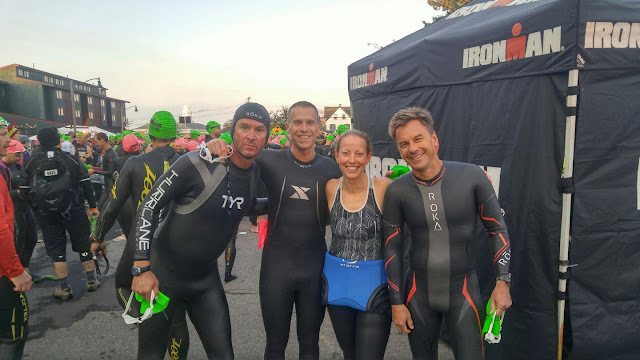 So they acknowledged several of the athletes who were present at that first race who were also present at this first Ironman 70.3 Lake Placid. Then they had the same vocalist sing the national anthem that sang at the first IMLP twenty years ago. Very cool. Very classy. Then the energy really began to buzz. It's impossible to ignore, at least I think so! I love the start of triathlon. I'm smiling. I'm dancing. The race announcer dude walks over and gives me a high five (highlight of my day!) Before I know it, I'm in line to start my swim with Chris, Larry, and Eric. There were two chutes set up and the volunteers were releasing four swimmers at once. The four of us got to start together! Super, super cool. Yeah, that was a long swim, ha! I was intentionally on the outside of the pack and was truly enjoying all that open water, but I guess it cost me. There was a little bit of fog which made sighting a bit tricky, but I never would have guessed that I was adding that much to my swim. The water was cool, I'm told 63°, with an air temperature in the forties. I thought the swim felt great, but I was concerned about how numb my hands and feet would be. I was right to be concerned!!! My hands and feet were like blocks of ice. This transition is a long one when you're body cooperates, longer still when it doesn't! I got to my bike, dried off best I could, jacket on, sock, shoe, sock, shoe, glasses, helmet, left glove (really difficult), right glove (impossible!!!) I tried for what felt like an eternity to get that damn glove on, nearly left it behind but knew that it was necessary, so I unracked my bike and made my way to Bike Out hoping I'd find a volunteer to assist me. Success!!! There were two volunteers right at the Bike Out inflatable and after another minute she and I were able to get that right glove on. Hallelujah! Yay! The bike! I love my bike! There is a decent amount of climbing on Placid's bike course, but I wasn't concerned about that. I was nervous about Keene Descent. It is really long and steep at places and I knew there would be some athletes who would hammer down that thing as fast as possible. I'm fairly conservative (okay, frightened) on downhills, and this one is a doozie. On my bike preview drive the day before we came across a couple on their bikes. We watched them coasting at thirty miles an hour and not once crank the pedals. Eek! So anyway, out of transition, down through town, and then you start to climb. I felt amazing and was glad I spent ten minutes in transition because those gloves were necessary! First five miles averaged 15.4mph, second five miles average 17mph. And then Keene Descent -average speed 29mph. Whaaaaaattt?! When I reached the bottom all I could do was laugh because I had done it. I did it! And it wasn't nearly as frightening as I had thought it would be! Then you begin this awesome stretch of flat where you can get aero and just go. Next twenty miles average speed (in five mile splits) were 22.7mph, 22.2mph, 20.4mph, 19.2mph. And then the last twenty miles you spend climbing. Those splits came in at 14.5mph, 15.2mph, 12.5mph, and 14.8mph. Those splits are slow, but I feel pretty good about it. I do have a whole new level of respect for anyone who has completed the full course there. Holy moly. 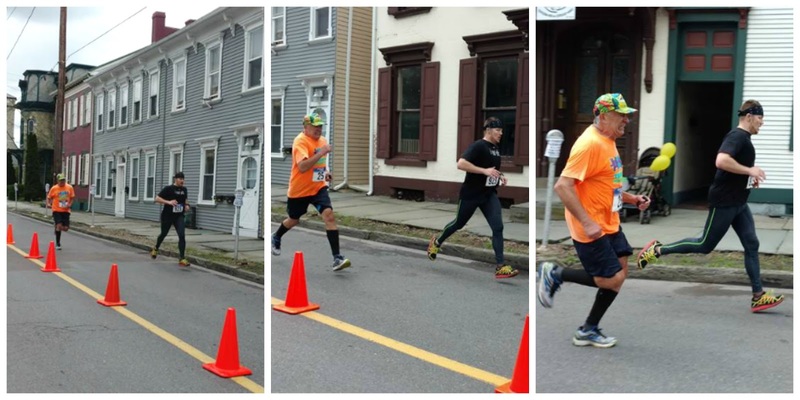 To have to do that bike course twice pre-26.2 mile run is a major feat! My nutrition was not perfect but sufficient. I did finish a whole bottle of Tailwind and some of my second bottle, forced down my Lara bar a little after halfway through the bike and ate at least half of my cola chews. The second transition was much better. My feet were still totally numb, but whatever, at least my fingers worked. Rack bike, helmet off, jacket off, shoe, shoe, grab visor and race belt, GO! Out of transition is downhill. My feet were completely numb, which is an odd sensation, but my shins were hating me for the descent. My shins don't normally bother me so I was hoping that once down the hill they'd be okay. I totally planned to utilize my "Walk-All-Aid-Stations" strategy that worked so well at Williamsburg. Aid stations every mile mean a little walk break to look forward to every 8-10 minutes. Yay! I was trying to ignore the fact that I had to pee really bad. I knew stopping to take care of business would just be not good. However, it became all I could think about, so shortly after the five mile marker I ducked into a porta-potty. And I was right, it was not good a good thing and starting back up again hurt. It began to feel like I would never reach the turn around point and I realized my mind was entering that dark, hopeless place it can sometimes go to when things get hard. I doubled down on my efforts to smile and thank volunteers, but it felt forced. When I got back to the ski jump I knew I didn't want to walk, but that hill looked never ending. I gave in. Once to the top of that though, I began to feel hopeful because I knew that I really was on the homestretch and that there would be a lot more crowd support for the portion of the run ahead of me. I thought the gas station hill was better/easier than the ski jump hill because it wasn't as long, even if it was steeper. Also, there were people there encouraging the athletes, which was not the case when climbing the ski jump hill. There was one French speaking woman who said "Go Zhanelle!" and I was like, "Ooh la la!" So then you get right in front of the Olympic oval but you can't go finish yet. You gotta make a right hand turn for another out and back before you can cross that finish line. Our house was very close to the turn-around and Charlie was out there cheering on the athletes and taking photos. I knew I only had about a mile to go, but I just couldn't pick up the pace anymore. If Charlie wouldn't have been there, I would have been doing a death march! Running into the Olympic Oval to finish was amazing. Very, very cool. As I approached the finish line I thought back to the other 70.3s I had completed, all the hours spent training, all the sacrifices made to get to that point, and about how far I've come since the very beginning. The finish line is a really emotional place for me and I think that feeling is one of the reasons I keep coming back. This trip, this weekend, was really a memorable one. I truly am grateful for all that triathlon does for me. It's hard to explain, why I love it so much, why it's so important, why it has meaning to me, or what that meaning even is. 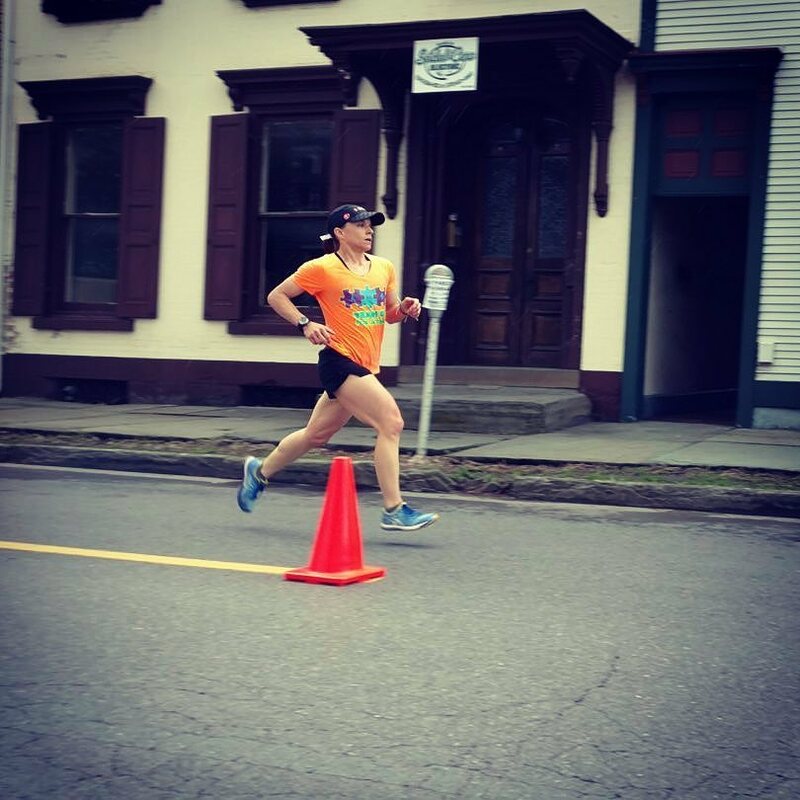 Sometimes I think becoming an athlete has been less about the workouts (as much as I love them) and more about realizing for myself what I have always been capable of- that achieving the "impossible" was, in fact, always within me. Every time I go farther or faster or do something I didn't think I could, I catch another little glimpse of that. Who wouldn't love that? My next adventure will be volunteering at IRONMAN Louisville next month. I'm extremely excited to be able to go to Kentucky and assist those athletes during their 140.6 mile victory lap. Oh my goodness, my next 70.3 is tomorrow and I haven't recapped my last one from nine weeks ago. How can nine weeks seems so short but yet so long?! So before I forget any more details, or mix details up, here's the Rev3 recap! 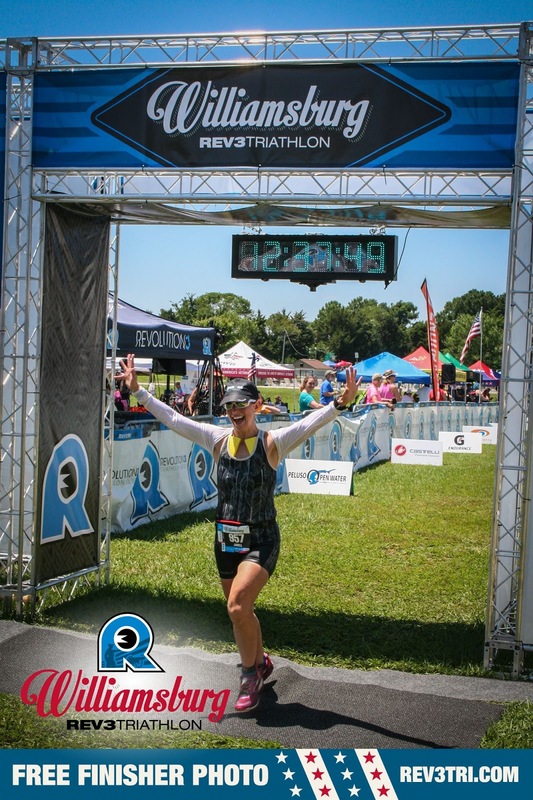 Rev3 Williamsburg 70.3 was held on Sunday, July 9th out of Chickahominy Riverfront Park, a fantastic, family friendly venue. And my family did go! I love when the kids are at these things. I really want them to see triathlon and what I've been training for. We drove down to my Aunt Mary's house on Friday and spent the night with her so that when we got up Saturday we could go check into our room and and do all the race things. Plus she fed us a delicious breakfast before we left (thanks Aunt Mary!!!) Once we left her house and hit the road, we decided to drive the bike course first. It's flat and fast and the road is in pretty good shape. Then we went back to the expo and at this point it is HOT. We didn't have any food or water and we were all getting pretty grumpy. So I did what I needed to do as quickly as possible while the kids took advantage of the bounce house on site. Didn't I tell you this place was family friendly?! I attended the athlete briefing, checked in my bike, and got the heck out of there. I had wanted to swim but truly was okay with skipping it. We were staying at a resort about seven miles away and once we arrived we discovered we were not the only Rev3 athletes there. Triathletes everywhere!!! And it took what felt like forever to get checked in. But once we were in the cool, quiet space of our suite, all was well. In fact, the kids thought having a TV in their bedroom was the best thing ever. And as before every race, you gotta check out your swag and then lay out all things triathlon to prepare for the morning. Really nice swag- visor, buff, shirt, and personal note!!! So my little troopers got up super dark and early to accompany me to transition and race start. Since we only had one vehicle, it had to be done. They were amazing. Aaron was amazing. I am so lucky. As for the race, the details at this point are a little blurry for me but I'll try my best to remember. Once all set up in transition, me and my crew walked down to swim start. I actually did a swim warm up. As they say, there is a first time for everything! Unfortunately, I sliced my toe open on the end of the boat launch. A minor annoyance for the rest of the day but nothing more. They played the National Anthem (and I teared up) while waiting for my turn to enter the water. When it was my turn, I gave my family some hugs and kisses, which made me tear up all over again. I think this was the first race I had to tread water waiting to start. Oh! And I almost forgot! The water was crazy warm! 85.3 degrees. Not wetsuit legal! Anyway, we swam out to the first swim buoy, turned left to the next turn buoy, but then the sun was in my face and it was difficult to see where to go. And there were people in every direction, so I know I wasn't the only one struggling to sight. Eventually I figured it out and this part of the swim is with the river current, so woooo! The bad thing about this swim? The stinky, sucky, thick, mud. The water was so shallow toward the end that I couldn't extend my arms the whole way, but you couldn't walk in this stuff either. So I ended up doing this swim-claw motion until I reached the swim exit. And oh that smell. Yuck! Transition was pretty uneventful. I did use a DeSoto cooling bolero which is a tad bit hard to get on wet skin, but not too bad. I was at the run in/out far, far away from my favorite spot in transition, the bike in/out. Sad face. A volunteer told me I looked strong and had great form. That felt nice! Jockeying for position with the athlete who ended up taking second in our AG. She didn't drop me til the last five miles of the bike. And that girl has some awesome, strong run legs. You go, Maria!!! At this one aid station I dropped the first two bottles of water they tried to hand me. When I finally held on to the third one everyone cheered. Hahahahahaha!!! I absolutely loved the bike course. Head back into transition and I almost fell trying to dismount my bike. My legs were just a bit wobbly. Jogged to my spot and got back out of there as quickly as I could. The run comes out of transition and runs on grass for a teeny bit before making a hard right onto the bridge. Up and over the bridge onto the Virginia Capital Trail. Loved this trail. It's paved and has a ton of shade and only little bumps for hills. 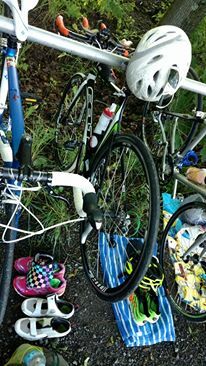 The aid stations were well stocked and manned by great, friendly volunteers. So in case you're unaware, it is hot in Virginia in July. So at every single aid station I walked and put ice in my kit, water over my head, re-soaked my lucky yellow sponges, and took a sip of water to drink. Every single station. I felt amazing. The run is a double out and back. The only time I didn't feel great is right after I crossed the bridge on my second time out. I was in a longer stretch of sun and I thought for just a moment about how hot I was and how I still had half the run to complete, but I was able to brush the thought aside and continue to smile. 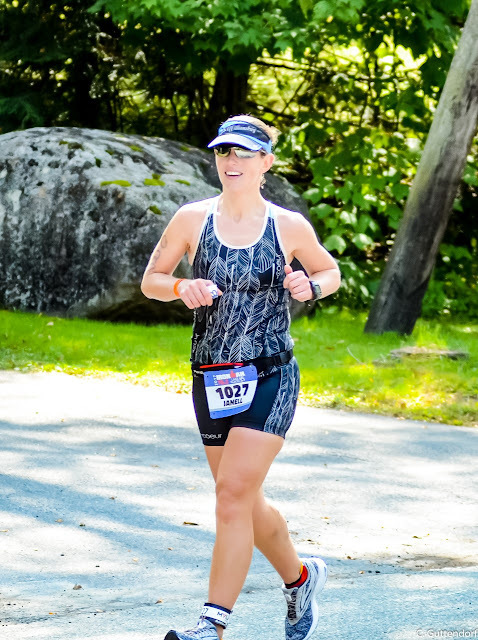 When I say that I smiled the rest of the entire run I am not exaggerating. I smiled the entire 13.1 mile run except for that one brief moment. I just felt so, so good. So good, in fact, that I fear the possibility of never feeling that way during a race again. But I guess that's one more reason to keep triathlon-ing. After you cross the bridge the second time on your way to the finish you run through the grass around transition, by the parking lot, into a very long chute, and cross the finish line. Unlike most races, family members are encouraged to cross the finish line with their loved ones!!! Unfortunately, my crew did not get there in time. But I saw them and knew they were nearby so all was well. Once across the finish line one volunteer removes your timing chip as another wraps this glorious towel that was just pulled out of a deep cooler of ice water around your shoulders. I think that remains my favorite part about the race!!! Also loved how they cater to families, gave individualized notes to each athlete, give everyone a free finisher photo, give the best swag, etc, etc. I gotta say, it was better than Ironman. 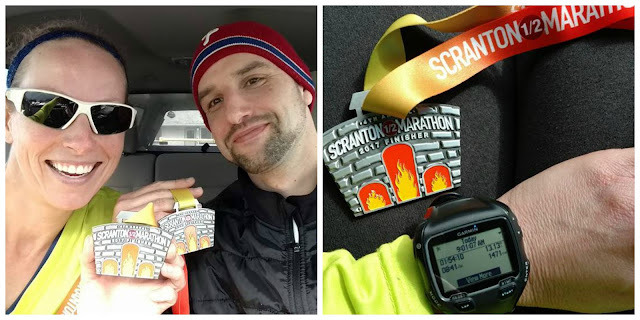 Huge medal and Garmin proof! I included the chart from Rev3's page just because I thought it was interesting. Bottom line- I loved this race. I'm convinced that Rev3 knows how to put on a good show. And I WILL be racing more of their events in the future! And with that, I can now go to bed and get some rest before IRONMAN 70.3 Lake Placid in the morning, haha! Wish me luck! Millheim deserves its own write-up. The weekend before the race my friends Misha, Lynn, and I drove up to preview the course. We ended up reversing the bike route (oops!) but we got the idea and had a few laughs in the process. 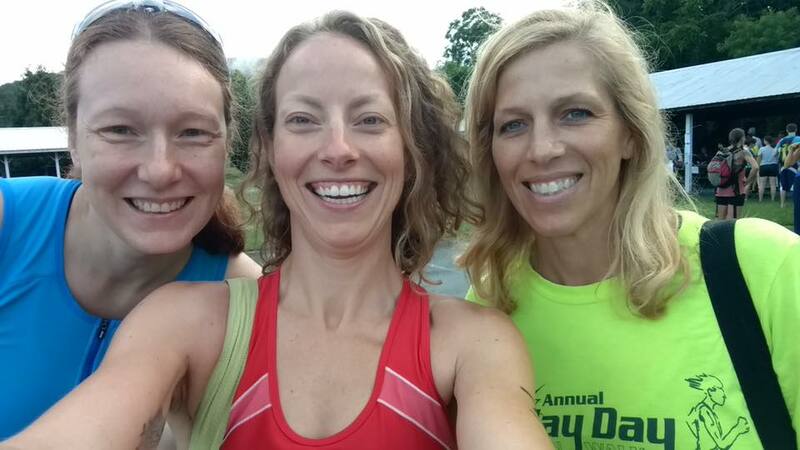 It's always advantageous to preview the course if you're able to before the race, but doing so with friends just makes it a ton more fun! So race day, Saturday June 24th, my friend Erica came to pick me up. And thank goodness! I like to get there early. But I also like to take my family. And it's just not nice to make everyone wake up at zero dark thirty. So Erica picks me up and we excitedly chat about all things triathlon on the way to Millheim. We find where we need to park without a problem. We rack our bikes on the way to packet pick up then walk on over to the pavilion to pick up our stuff. Then we scoped out the scene. 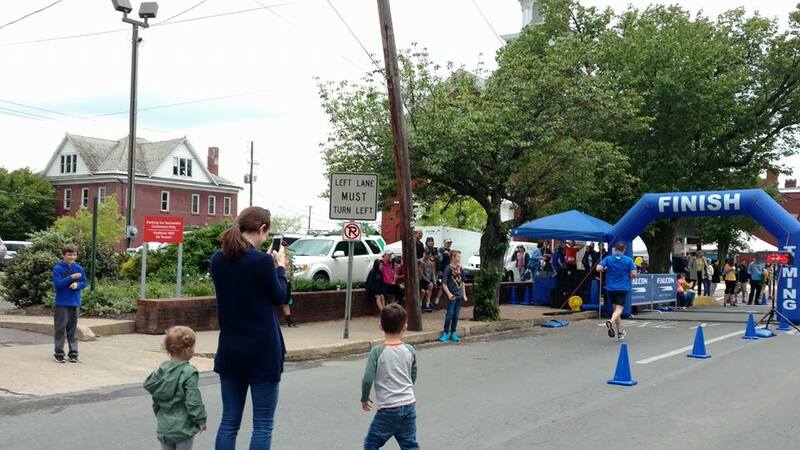 It's a 300 yard pool swim followed by a long transition through the playground and over the creek to the bike racks, followed by 15 miles through some pretty countryside on bike, finished up by a three mile run out and back through town. Some folks split up their transition stuff with some stuff by their bikes and some stuff in the playground. Millheim is cool that way in that they are very chill about things. I decided that I would leave a tiny towel and flip flops near the pool exit to use on the way to my bike. There was some rough turf to cover between the pool and my bike so I wanted something on my feet. Otherwise, I just set up transition as I normally would by my bike. Soon it was time for pre-race announcements and to line up at the pool. When registering you submitted your estimated time to finish a 300 yard swim and were then seeded accordingly. Erica and I were side by side, so that was cool! My friend Misha was in the line a little behind us. It was so, so inspiring to see her there at her first tri with her game face on. 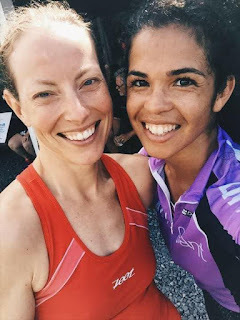 I knew her nerves coming into the race, but looking at her in that moment, I would have never guessed it was her first triathlon. Lynn was competing in the Mini Millheim and would be starting later. Other friends were there too, Jesse, Stu, Richard, Tom, & Marty! A really fun, chill gathering! And before I knew it, it was time to swim! I submitted a time of 6 minutes when registering, so pretty accurate if I do say so myself! What's crazy and unique about Millheim Pool is how shallow it is. I saw several athletes aqua-jog their swim! So my brilliant idea to use flip flops completely backfired on me because I had the hardest time EVER getting them on! I left my swim cap and goggles there for some reason, and at the end of the day never picked them up. The race director went above and beyond by delivering them back to my house personally on her way through my town the next week. It was my new goggles and my Timberman swim cap, so sentimental value there! Coach told me to put it all out there on the bike. Hold nothing back. So okay then. Makes race strategy easy, ha! One by one I'd reel in the athlete ahead of me and pass. I pushed hard ignoring any burn in my legs or any thoughts of the impending run. Erica and I had a fun back and forth and I had another back and forth with a guy in a blue shirt... although he didn't seem to enjoy it as much as I did. Hahaha! Turns out I didn't get passed by anyone out there! I got back to transition and was super stoked to see my pace. My family was right by the bike rack so I quick changed my shoes and got some sweet hug-kisses in before heading out on the run. Not the first place finish I was hoping for, but it's hard to be disappointed after such an amazing day. 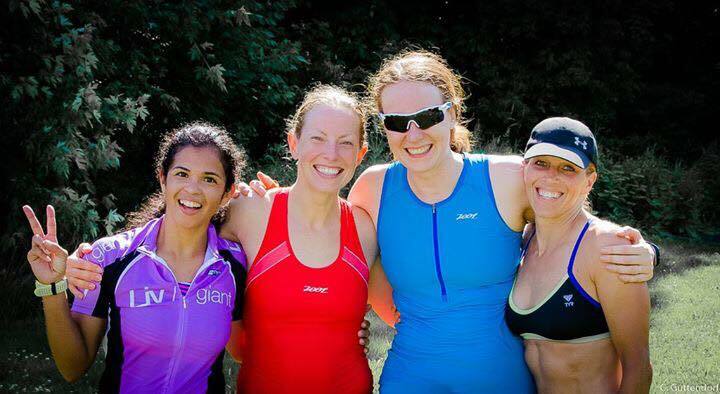 Racing with Erica, Misha, and Lynn was equal parts fun and inspiring. I mean, how wonderful to have strong women in your corner who by pushing themselves, push you too. These ladies celebrate one another's victories and help brush off the losses. This is sportsmanship at its finest, and how lucky am I to be surrounded by such fine athletes?! Okay, so if I'm being honest, I just don't remember any/all the details of these races anymore. But I gotta mention them before continuing to write about other things out of chronological order. It's been driving me crazy! So here's the nitty gritty. Got to run with Aaron! 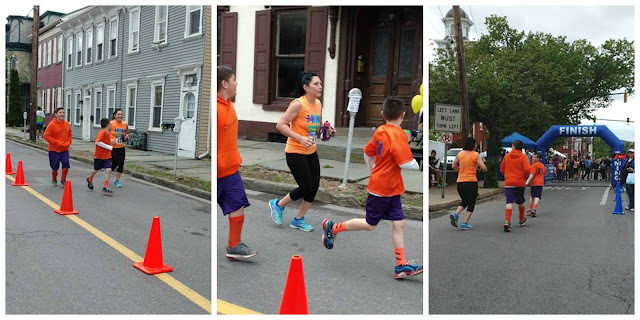 His brother ran and my good friend Kristen too! I was a lot slower than last year though (booo! ), however, still earned second in AG! Did NOT feel very good during this race. Temps were in the mid-60s, which felt so hot. Did get to run with Aaron again, so that was a ton of fun! Plus smaller age groups means better chance at placing, which I did, so I got cookies!!! Ran with Aaron AGAIN! Loved the course, loved the finish line atmosphere, loved running 13.1 miles with my hubby, would definitely race here again. Stud muffin and a cool medal... I'd say that makes for a great morning. 3rd Female Overall and fastest female on bike (I'm super proud of that! )- WOOOO! This day was one of my favorites ever. And I think that brings me up to date! On deck to recap is Rev3 Williamsburg 70.3! Do you have any idea how amazing you are? Do you understand how your kindness, your bravery, and your willingness to try has a ripple effect? We were able to spotlight many of the team members on our Facebook page prior to race day, but I just gotta talk a little bit more about you all here. 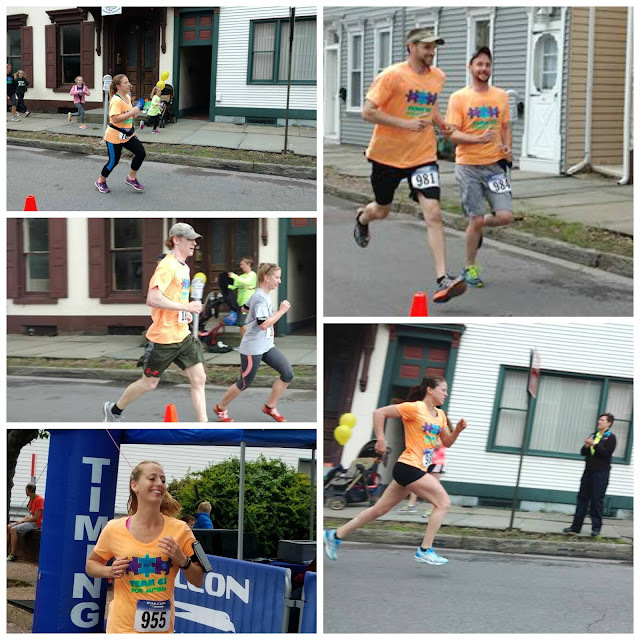 We had some first time half-marathoners- Arielle Webb, Travis Weaver, Shelley Merrell, Kira Leitzel, Tiffany Stevens, and Christian Kauffman. It takes a lot of bravery to decide you're going to do something you've never done before, and running a half marathon is no small thing. Thank you for that bravery and willingness to try. They all look so amazing.... is it really their first half?! We had some seasoned runners with us as well who showed us their athletic prowess. 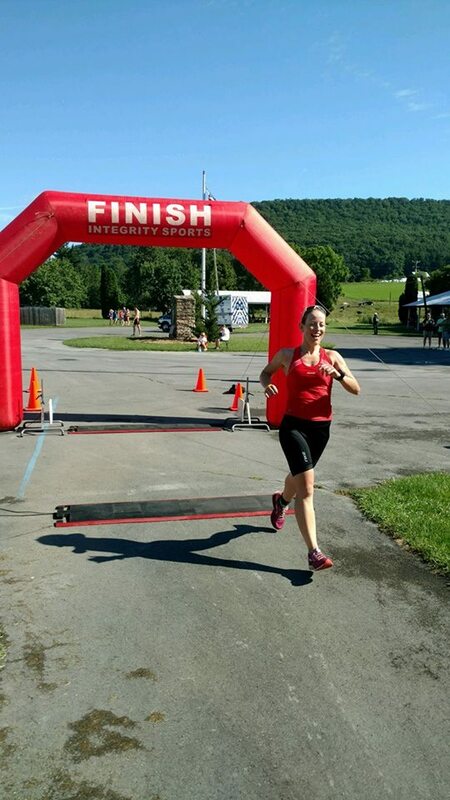 Kelly Harris earned 2nd Overall Female, narrowly missing First Place by only 26 seconds! Shannon Pyles, Krista McCrum, and Glen Stook all placed in the top 25 runners overall. Arielle Webb (one of our first timers) placed 3rd in her age group. Thank you for sharing your fire and drive. Glen finishes with his family looking on. Shannon and Krista stop for a photo! But sometimes, it isn't where you place that makes you stand out, but rather it's the tenacity it took to get you to the finish. Check out the photo collages below and be inspired. I mean, c'mon! Here are Aaron and Robin. 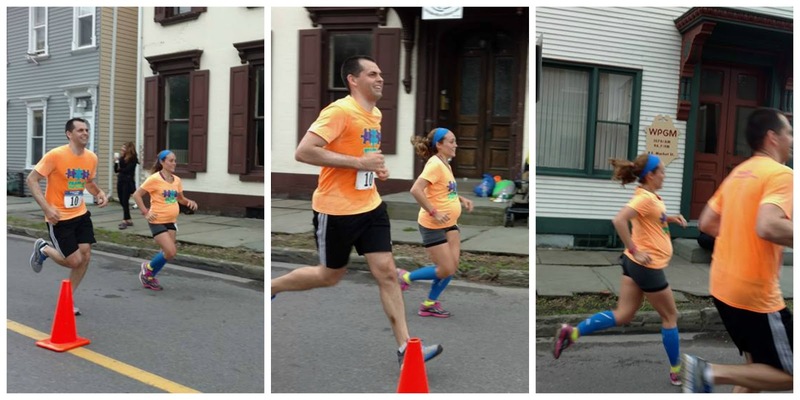 They're expecting their first baby this summer, so hey, better squeeze in one more road race first, right?! Robin finished strong and made it look easy! This is Steve. He decided he was going to beat the guy in black to the finish. So he gritted his teeth and he did. And here is Jenn. You ever get to that point where you just want to quit, but then you remember why you started in the first place? I think that's what we were blessed to witness here. Now I don't know why all these wonderful people decide to run with Team CJ, but for some it is a close connection to a person with autism. As parents to children with autism, the cause hits close to home for Justin & Kristen Brouse, Don Shipe, Kira Leitzel, Krista McCrum, and Aaron Weaver. I don't know what each of you go through every day, but I have a very good idea, and I just want to thank you and applaud you all for helping me spotlight in your daily lives what autism is (and what it isn't), as well as the extraordinary capabilities of children like ours all while working to secure the special accommodations they may need. You are all total rock stars. Yep. You're all rocking it. 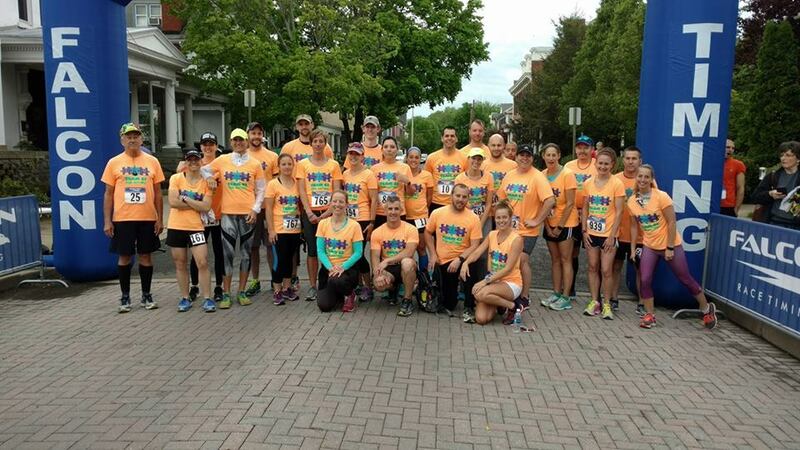 We also had Team CJ volunteers supporting the race this year! Thank you so much Lynn, Erica, Cathy, Betsy, Meagan, Steve, and Misha! I wish I had gotten a photo of all of us! You may be wondering how the fundraising side of all this worked out. Well, I really thought this group could surpass our previous campaigns so I set the goal at $8501. As I write this we collected a total of $8417. So close!!! There will be a few more donations coming in, so I'm crossing my fingers that it will push us over our goal. If you're reading this and want to help with that, the link below will remain open for the rest of the month of June. 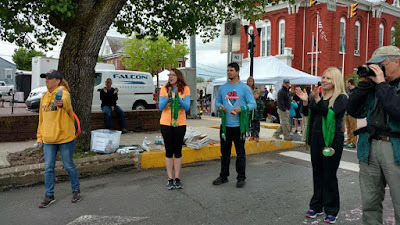 Proceeds will be donated to ADERS (Autism Diagnostic Evaluations Resources & Services), a local non-profit located in Montandon, PA. ADERS's mission is "to provide comprehensive diagnostics, evaluations, resources, and advocacy to drive treatment and intervention planning to enrich the quality of life for individuals and families affected by ASD." They are working toward comprehensive autism services across the life span. as I try to tell you all how grateful I am. Our orange Team CJ shirts could be seen all over the place! That's 167 people who thought about those individuals touched by autism and took action. Thank you to Aaron B., Robin, John, Steve, Justin, Kristen, Jamie, Jenn, James, Kelly, Kelli, Dave, Christian, Julie, Rachel, Kira, Krista, Bill, Shelley, Alex, Shannon, Stephany, Don, Kristin, Michelle, Ali, Tiffany, Glen, Jen, Aaron W., Travis, Arielle, and Rob. What you did was no small thing. 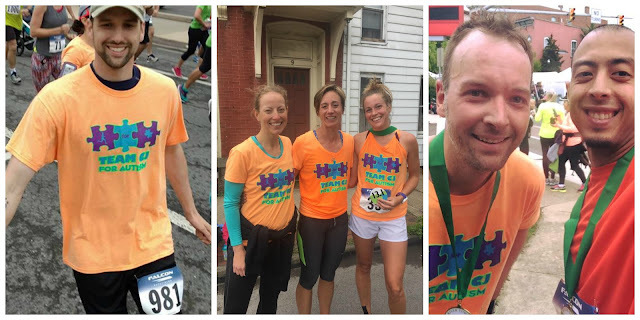 Your willingness to run for autism and bring Team CJ to life is incredibly inspirational. I am deeply grateful for your kindness, your bravery, and your willingness to try.